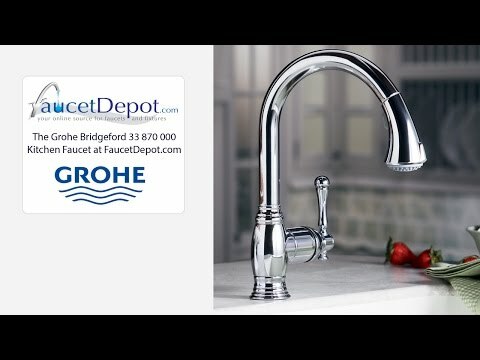 What is the Best Luxury Kitchen Faucet in April, 2019? Which Luxury Kitchen Faucet Will You Invest In? Before we look at some of the key features and answer some of your questions, we have decided to look at the top 17 kitchen faucets that could improve the overall style of your home. These faucets have all been tested for quality to ensure that you do get the best possible value for your money. Hansgrohe Axor 10820001﻿ Industrial Faucet 9-5/8" 10-5/8" 1.75 GPM Check price! Moen 5923SRS﻿ Industrial Faucet 22.50" 10" 1.5 GPM Check price! Kohler 77515-VS Industrial Faucet 9.5" 10" 1.5 GPM Check price! Grohe 31380DC0﻿ Industrial Faucet 5.85'' 9.31'' 1.75 GPM Check price! Hansgrohe Axor 39840001﻿ Industrial Faucet 8-7/8" 10-5/8" 1.75 GPM Check price! Franke FFPD4350 Industrial Faucet 7 1/8'' 9 1/4'' 1.75 GPM Check price! Delta Faucet 9159T-CZ-DST Touchless Faucet 15.6875" 9.5" 1.8 GPM Check price! Delta Faucet 9193T-KS-DST Touchless Faucet 16'' 9.5'' 1.8 GPM Check price! Delta Faucet 9183T-AR-DST Touchless Faucet 16'' 9.25'' 1.8 GPM Check price! ﻿Hansgrohe Axor 10824001 Pull-out Faucet 7.5'' 7.625'' 2.2 GPM Check price! Delta Faucet 9192T-SSSD-DST﻿ Pull-out Faucet 15.375'' 10.344'' 1.5 GPM Check price! KOHLER K-6331-CP Pull-out Faucet 252 mm 229 mm 2.2 GPM Check price! Kohler K-99259-VS Retro Faucet 17-5/8'' 11-7/16'' 1.8 GPM Check price! ﻿Grohe 33870DC2 Retro Faucet 14 1/16'' 8 1/4'' 1.75 GPM Check price! Moen S711ORB 3-Hole Faucet 12.25'' 9.38'' 1.5 GPM Check price! Delta Faucet 4380-DST 3-Hole Faucet 13'' 10.5'' 1.8 GPM Check price! Brizo 62536LF-RB 3-Hole Faucet 7 3/8'' 9 27/32'' 1.8 GPM Check price! Hansgrohe Axor 10820001﻿ 9-5/8" 10-5/8" 1.75 GPM Check price! Moen 5923SRS﻿ 22.50" 10" 1.5 GPM Check price! Kohler 77515-VS 9.5" 10" 1.5 GPM Check price! Grohe 31380DC0﻿ 5.85'' 9.31'' 1.75 GPM Check price! Hansgrohe Axor 39840001﻿ 8-7/8" 10-5/8" 1.75 GPM Check price! Franke FFPD4350 7 1/8'' 9 1/4'' 1.75 GPM Check price! Are you looking for the best faucet to quickly clean dishes or fill pots with ease? This Hansgrohe Axor 10820001 could be the product you’ve been looking for. It is great from performance and design perspective. Although it is expensive, it is a product worth investing in for your residential or commercial kitchen because it makes cleaning of dishes effortless. It is easy to operate whether you want hot or cold water. Also, it has the great pressurized flow of 1.75 gallons per minute to ensure that the residues are removed with ease. The overall height stands at 22-7/8”, which is high enough to put many dishes under. But, make sure there are not cabinets above your sink, or, at least, ensure they are placed high enough. The spout reaches to 10-5/8” from the center to the outlet. Installing this faucet is also simple with its single hole. This semi-pro kitchen faucet by Axor is one of the best in the industry. It has all it takes to make dish washing in the sink an absolute breeze. I will recommend it to avid chefs. It swivels 360 degree for a full access to the sink and its surroundings. Moen 5923SRS can be a focal point of your kitchen decors with its professional and aesthetic look. Featuring chrome finish and stainless steel, the faucet is sure to withstand damp environments without corrosion. It is a pulldown faucet, so you will be getting water with ease to your desired direction. With only a single handle, you can control the water. It has a flow rate of 1.5 gallons per minute, which is not really the best but, nonetheless, moderately fine to clean your dishes. The spout height is 22.50 inches, which is also high enough to put many dishes under. The aerated stream makes cleaning effortless. The faucet can be helpful in a commercial kitchen for heavy-duty cleaning. It installs with easy with the quick connect system. This pulldown kitchen faucet is a must-have for commercial kitchens especially where heavy-duty cleaning is involved. It cleans with ease. Its performance is top-notch with a pressurized aerated system. Then the quick connect system makes installation an absolute breeze. For your commercial kitchen heavy-duty cleaning, Kohler 77515-VS could be your go-to option. It is a stainless-steel faucet, which prevents any corrosion, and also matches with lots of kitchen furniture. It is one of expensive faucets; however, its performance and design make it a worth-having investment. To give you full access to your dishes, it rotates 360 degrees. Furthermore, this faucet is multi-functional: has the sweep spray, aerated stream and BerrySoft spray. All these sprays make cleaning a cinch. The faucet’s high-arc gooseneck clears more space for your plates. The coil on the faucet is removable in case you want to service the faucet. Note that this is a pulldown faucet, a popular design that makes water flow effortless. To make heavy-duty cleaning easy, I certainly recommend this faucet. It performs well with its pulldown design and multifunctional sprays. Also, it rotates with its high-arc gooseneck spout to make cleaning easy. Grohe 31380DC0 makes a bold statement in any kitchen. Featuring a pull-out spray and switchable flow-mode, the faucet makes heavy-duty cleaning a walk in the park. Grohe SpeedClean prevents limescale build-up in the spray head while the ceramic cartridge prevents against corrosion. The faucet with the 21-1/4” tall height which is high-enough to clear space under. If you want a taller one, you may opt for the 26-9/16” faucet height. Apart from the difference in faucet heights, the designs and performance are similar. This semi-pro faucet is easy to maneuver around to enjoy washing dishes or filling pots. It can rotate or swivel to the desired angle. This an ideal industrial kitchen faucet to make dishwashing an enjoyable task. It performs well with a great flow rate and controls. The design is scratch and tarnish-resistant. Although it is expensive, it is worth the price of money. Axor is a renowned brand of kitchen faucets. However, it is one of expensive brands. Hansgrohe Axor 39840001 offers premium quality and stellar performance in your kitchen. Its chrome finish draws attention to make it a focal point. The overall height is 25-1/8”, which is one of the best while the spout height stands at 8-7/8” and reaches out to 10-5/8”. You only need a single hole to install this faucet. With the flow rate of 1.75 gallons per minute, you will have enough pressure to remove stains on your dishes. The faucet features 2 spray modes: full and need spray where a full spray gives a saturated pressure and the needle gives more pressure for the toughest stains. Furthermore, the faucet is versatile and flexible with a 360 degree swivel. Axor never disappoint with premium quality faucets: this product is evident to that. For anyone looking for a highly-efficient kitchen faucet for heavy-duty cleaning, this is an ideal product. Franke FFPD4350 is a single-handle type of faucet easily controllable to clean your dishes. Simply pull it down to access water with easy. When not in use, its magnetic sprayer dock will hold the spray in place. The faucet is 21.625-inches high and it’s only available in this size. Considering that many faucets are over 25 inches, this faucet is not really one of the tallest. Nonetheless, it is still impressive. It features the stainless steel, which matches seamlessly with your kitchen décor. While the height is not really impressive, the faucet comes with an impressive flow rate of 1.75 gallons per minute. That’s a great pressure for heavy-duty cleaning. Also, it swivels at 360 degrees to access many directions while cleaning. Its spray helps you toggle between the full and needle spray. If you want a compact industrial faucet, this could be your best choice. It comes with superb features and an impressive flow rate. The design features the sleek stainless steel. I couldn’t find the drawback except its single size choice. Delta Faucet 9159T-CZ-DST 15.6875" 9.5" 1.8 GPM Check price! Delta Faucet 9193T-KS-DST 16'' 9.5'' 1.8 GPM Check price! Delta Faucet 9183T-AR-DST 16'' 9.25'' 1.8 GPM Check price! If you are always hands-on, for example, baking cakes or manually preparing foods, you would want a touchless faucet. This Delta Faucet 9159T-CZ-DST could be your best buy with its touchless technology. No need to tamper with manual controls other than touching with your arm to trigger the water flow. This faucet can make your kitchen look extra special. You also have the option to operate it manually using the integrated single-lever-handle. Its LED indicator helps you keep the temperature in check. If not in use, the magnetic docking can hold the pulldown sprayer in place so it doesn’t fall. The faucet is an ideal choice for all kinds of kitchens. It lasts longer and performs better than many. Installing or cleaning it is also a cinch. You may use either the single or triple hole to install it. Make sure you clean it consistently to avoid lime scale build-up overtime as it can tarnish your beautiful faucet. I recommend this faucet for busy professionals who always get their hands dirty. This faucet has all that it takes to make your job simple. It installs with ease. But, prepared to spend over $500 on the product. Delta brand never disappoints with its Touch20 Technology. Touch anywhere on this Delta Faucet 9193T-KS-DST to activate the water flow and get started cleaning your dishes with an impressive water flow rate. It can be a great help for those always getting their hands messed up. Also important with this faucet is how it conserves water. It features an automatic shut-off after 4 minutes to conserve water and the battery. Meanwhile, its LED indicators let you know when the faucet is active or when it has a weak battery. With this faucet, you might always aim to wash dishes every hour. The faucet features the pulldown spray, which can be held in place by the magnetic docking system. To keep the temperature in check, there is the TempSense feature to accomplish that. Delta brand always has a great range of kitchen faucet. This faucet is a great buy even though it is expensive. There’s no need to wash your hands before operating the faucet. Touch anywhere then you are ready to go. Got messed up hands? Why not consider the Delta Faucet 9183T-AR-DST. This could be the product you’ve been looking for if you always get your hands dirty in the kitchen. It also helps you conserve water. Embracing its Touch20 Technology, Delta made this product one of the best for heavy-duty commercial and residential kitchens. All thanks to the MagnaTite Docking that you can snap the sprayer and prevent it from falling. Again, thanks to the LED indicators which help you see if the faucet is active or it’s running low on battery. Even more, the TempSense allows you to check the temperature of the water by reading the color change of the indicator. This faucet installs with ease. It also lasts longer thanks to its DIAMOND Seal Technology which prevents any water leakage. Delta always offers premium quality kitchen faucet. This one is proof to this statement. At any time, I will recommend the product to anyone looking for a touchless faucet. If you want, you may opt for the single-level manual operation. ﻿Hansgrohe Axor 10824001 7.5'' 7.625'' 2.2 GPM Check price! Delta Faucet 9192T-SSSD-DST﻿ 15.375'' 10.344'' 1.5 GPM Check price! KOHLER K-6331-CP 252 mm 229 mm 2.2 GPM Check price! Simplicity versus impressive performance: this faucet by Axor makes sink cleaning a cinch. Finished with chrome, it withstands damp environment that would otherwise cause corrosion. And, although it is pricey, the faucet is worth the value of money. Hansgrohe Axor 10824001 features the durable ceramic cartridge, meaning you not returning to the store anytime soon. When it’s time to clean, pull down the sprayer to remove the toughest stains. When you’re done, the MagFit magnetic will hold the spray in place. You get two spray mode: full and needle. With a swivel of 150 degrees, you can maneuver the faucet around. Upgrade you sink with this product. I do recommend it to give the kitchen a new look and functionality. The faucet is finished with chrome, which is one of the attractive finishes to match with many kitchen decors. Looking for a pull-down faucet that you can activate by touching anywhere? Delta Faucet 9192T-SSSD-DST has that feature. Simply pull it down to get the water to the dishes with ease. Delta has a wide range of kitchen faucets of top-notch quality. This faucet is one among many and it has best features such as magnetic docking to hold the sprayer in place if not in use. Not sure about water temperature? No problem, the TempSense LED indicator can help you achieve that. Also, the faucet features the patented DIAMOND Seal Technology which plays a pivotal role in preventing leaks. The faucet’s Touch20 Technology makes usage stress-free for busy chefs. Touch anywhere then you’re set to get the flow rate. It is also effortless to install this faucet using a single, double, triple or four holes. Among others, this faucet offers a premium design and a sterling performance in any kitchen. It is a great product if your hands are often dirty in the kitchen due to hands-on activities. The faucet is operated by touching anywhere else. I recommend the product. 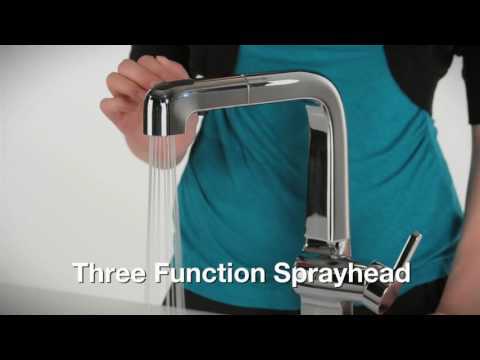 Kohler is one of the top brands when it comes to kitchen supplies and especially the faucets. The Kohler K-6331-CP a contemporary design that should improve the overall look of your kitchen. It is capable of turning the full 360-degrees to give you water access anywhere you might need it in your sink. The spray head includes 3 different functions that range from spray to aerated flow. This will ensure that you have multifunctional use and the motion light keeps you from touching the faucet constantly and having to wipe it down every time. The MasterClean features also keep any mineral buildup from becoming problematic and this will ensure clear flow all the way. Even though this faucet does come with a great lifetime warranty, it is still one of the most expensive faucets on the market today. We would recommend it as one of the best. The upside is that this can be returned to the manufacturer and they will replace the faucet if this occurs. Kohler K-99259-VS 17-5/8'' 11-7/16'' 1.5 GPM Check price! ﻿Grohe 33870DC2 14 1/16'' 8 1/4'' 1.75 GPM Check price! This Kohler K-99259-VS is characterized by superb features. It features the BerrySoft spray, Sweep Spray and the aerated stream. With the aerated stream, you can wash your dishes using the high pressure by pulling down the 17-5/8” spout. On the other hand, BerrySoft spray offers a lighter spray which you can use to clean your vegetables or fruits. Sweep spray is also ideal for cleaning the dishes. All in all, this is a great and versatile faucet worth considering for your kitchen. To keep the sprayer in place, there is the DockNetik, which is a magnetic docking system built-in the spout. It locks the spray head and help release it when in need. Only a single control of the lever can give you the water flow needed from this stainless steel faucet. This is highly recommended for your kitchen. It comes with great features you would expect in a typical kitchen faucet. From the design to the performance, the faucet is impressive. With just a single lever, you can toggle between the two spray modes and enjoy washing the dishes or cleaning fruits and vegetables. Grohe 33870DC2 is a faucet of choice for many kitchen, especially homeowners who love simplicity. It is such a compact with super steel infinity finish to lengthen its durability. The faucet operates smoothly by swiveling 360 degrees to reach any side of the sink. Meanwhile, its SpeedClean anti-lime system ensures that there is no accumulation of residues which can jeopardize its longevity or hamper its performance. This is actually a small faucet with the height of 14-1/16” while the aerator’s height is 7-1/8”. It is, nonetheless, a faucet worth having. By assessing its features, this I a faucet worth having for all your kitchen chores. It gives you the freedom to toggle the spray modes while also pulling down the spout. The design is superb with the scratch and tarnish-resistant materials. We highly recommend it. Moen S711ORB 12.25'' 9.38'' 1.5 GPM Check price! Delta Faucet 4380-DST 13'' 10.5'' 1.8 GPM Check price! Brizo 62536LF-RB 7 3/8'' 9 27/32'' 1.8 GPM Check price! If you have a countertop or sink with three pre-drilled holes, then good shot for this Moen S711ORB. The faucet was designed to add a remarkable value in your kitchen with its aesthetic oil-rubbed bronze. Water flow control is easy with a single handle alongside the spout and the side spray. With the aerated side spray, you can focus the water to heavy-duty cleaning. All within the control of the single lever handle. For a kitchen décor that has a black or charcoal theme, this faucet could be the best buy. The gooseneck design clears more space for your dishes. Installing the machine shouldn’t be difficult at all with its durable quick connect system. That said, even a beginner can manage the installation. Instruction are given. The manufacturer also offers a limited lifetime warranty. For more variety and versatility, we recommend this 3-hole faucet. It comes with the side spray which makes heavy-duty cleaning an absolute breeze. What else were you looking for? The design is good, even though the color black could be restrictive to other decors unless you ignore it. For your cleaning needs with the side sprayers, Delta brings you the Delta Faucet 4380-DST. It needs 3 holes to install; it would be better if your countertop or sink already has the pre-drilled holes. You can still drill the new ones. This faucet is one of the affordable kitchen faucets under $400. It is available in different finishes: Venetian bronze, arctic stainless and chrome. The choice is yours that which matches with your kitchen furniture. This faucet comes with the patented DIAMOND Seat Technology, the technology that Delta is popularly known for. It ensures a leak-free operation in line with the standard ASME A112.18.1 of 500 000 cycles. Also, the faucet gives you a complete flexibility with its 180 degrees swivel. Again, it is easy to control this faucet with its single-lever handle. You need 3 holes to install. All mounting hardware is included in your purchase. On top of that, the manufacturer is offering a limited lifetime warranty. With Delta brand you never go wrong. The company has lots of faucets and you have to choose from the standard or Touch20 version. This faucet comes in three variances: arctic stainless, chrome and this bronze. We recommend the product for any kitchen setting. Brizo 62536LF-RB is one of the kitchen faucets that can add value to your kitchen in case you think of future resale. It has its unique design that is coupled with the Venetian bronze to match with many kitchen units. From the aesthetic appearance, it is an attractive faucet. The control of the faucet lies in its double handle. Adjust water with ease to either wash dishes or fruits. Thanks to its side spray that you can use for heavy-duty cleaning if you want the faucet in your commercial kitchen. The ceramic disc valve in this faucet is durable and so is the overall design; you will spend many years using the faucet without any sign of wear or corrosion. Although its bronze may not fit all kitchen themes, we still recommend the product and encourage kitchen owners to shop with care. Apart from that shortcoming, the faucet is a great purchase. From performance to the design, it is indeed a product worth having in your kitchen. Manufacturer backs with it the limited lifetime warranty. Hapilife Hapi-03Z﻿ 230 mm 170 mm Hapilife MirrorLook Technology provide a lifelong bright for this tap. Easy to keep it clean Check price! Funime TK13 245 mm 146 mm Exquisite Looking: Ceramic white dual lever and ceramic disc cartridge Check price! Detroit Bathware Ys 4564 10'' 7'' With about 700mm handheld shower. 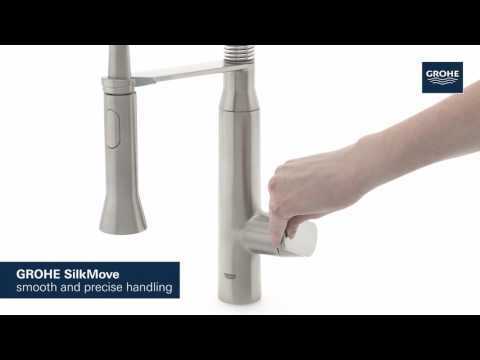 Swivel spout for 2 sinks Check price! iSpring GA1-B 6 1/2'' 5 1/2'' Ideal upgrade for undercounter water filters and reverse osmosis systems Check price! Yodel Faucet FBA_YDKF-1 9 1/2'' 6 3/4'' Tighten the hose easily by hand,no need wrench Check price! VAPSINT OHT069L 8.9'' 9.5'' Dual Function Special Sprayer Water Mode: Aerated Stream & powerful Sprayer Cleaning Check price! First, on our list, we have the Hapilife Hapi-03Z and this faucet is designed with a stylish chrome finish that will ooze class and style to any user. It is quite heavy at almost 2 pounds and is made from durable brass materials, but the chrome finish will give you the effect of basically looking into the mirror. The faucet comes with 2 different levers and has the ability to swivel around at 180-degrees to be a little more functional as well. One of the main things we liked is the unique design that looks completely different from some of the other kitchen faucets that you will commonly find on the market. The faucet also includes a feature that will allow you to change the water from flow to spray if you need to get rid of grime and dirt on your dishes. The faucet is actually quite affordable when looking at the price and this does make it a great investment for anyone looking to upgrade. We do not really consider this one luxury in terms of the features, but rather the stylish and unique design that sets it apart. It is also worth mentioning that the faucet is backed by a 10-year warranty that should give you some additional peace of mind. materials to add that extra level of durability that could potentially make a huge difference. As with the other faucets, it is also finished with chrome, giving it a clear and mirror-like look that will improve the overall look of your kitchen. This faucet has been tested for stubborn drips and it does not really leak over time. It also features a unique design with the white taps on each side that makes it easier for you to operate as well. This faucet is quite easy to install and it comes with an additional hose to extend the reach of your water supply if you need to fill up things like coffee makers from a distance. Once again, this faucet has been priced really affordable and should be a great option to improve your kitchen or the look of it at an affordable price. The faucet is also backed by a massive 10-year warranty and can be returned within 30-days if you have detected any problems or things that you do not like. This faucet is also easy to install and compatible with most plumbing specifications. The Detroit Bathware Ys 4564 is one of the most functional thanks to the pullout feature, it offers users. It is made from top quality materials and features the spray or flow function depending on your needs. The design is quite large and the chrome finish once again adds some style to the faucet that you could use in your kitchen. The benefit of this faucet is the fact that you will have a longer reach and it will not be damaged as it retracts after it has been used. The biggest downside to this design is the sheer size. It might look functional, but once you install it, you will notice that it might not be functional and the pullout feature does spoil the design somewhat. The price is really affordable for this faucet and it also comes with a 2-year warranty that should keep you protected from any manufacturer problems and defects that might occur. However, we would not really recommend this faucet to be used in the home, but rather in places like restaurants where it might be a little more practical. The iSpring GA1-B features a normal design that will definitely look great in your home. It is somewhat thinner and more petite and this will look perfect in some of the smaller kitchens, making it ideal for upgrading your kitchen to look somewhat better. It is constructed of durable brass materials and includes a stylish chrome finish to give it that mirror-like effect. The faucet is designed to be compatible with most water filter system and will even accommodate the reverse osmosis process to ensure that your water has been fully purified and healthier to drink for friends and family. The faucet is capable of turning the full 360-degrees, but care needs to be taken as the build-up of minerals in the faucet could sometimes lead to leakages or even bigger problems if they are left untreated. The price of this faucet is actually quite affordable and will be a great affordable option when it comes to upgrading your home. We would certainly recommend it for smaller kitchens. It is 11-Inch tall and has a swivel spout with a reach of 6.25-Inch. for 1/4-Inch tubing. The Yodel Faucet FBA_YDKF-1 is a great stylish faucet that can be ideal for your kitchen or your bathroom. It features a square design, making it versatile enough to be used in any water area of your home. The faucet is also constructed of durable brass materials and offers a stylish finish that should improve the overall look when it has been installed. It is one of the easiest to install and does not really require any specialized tools for you to have it installed correctly and ready to use. This faucet is designed to be leak-free and the swivel can move in both directions to make it easy for you to fill up both sinks with water. This faucet is also compatible with water filtration systems and should be a great addition to your home. In terms of the price, the faucet is actually really affordable and we would definitely recommend it to anyone looking for a new one. The fact that it can be used in both the kitchen and the bathroom makes it one of the most versatile options if you are looking to make the home look the same when it comes to the water access points. Last, but certainly not least, we have the VAPSINT OHT069L and this faucet is designed from premium quality brass and it has been finished with nickel to not only help resist any rust but also improve the overall durability of the faucet. It is quite tall and heavy as well and the pullout feature will add some much-needed versatility as well. This faucet also features 3 different spray modes that might be handy. However, it might be a little oversized for the average home; it will be a great investment for anyone in the restaurant industry to ensure overall quality and style while giving the workers a functional faucet that will clean virtually anything. Looking at the price, you might be stumped to see how affordable it actually is and the fact that it is one of the best faucets on the list will make it a great investment. It is also worth mentioning that this specific faucet also comes with a lifetime warranty if you need to replace any of the parts that might break or wear out over time. The kitchen faucet is actually one of the best ways that you could improve the style and the functionality of the way you use water in the home. It also offers the ability to add some style to the look and the appearance of your kitchen if you have guests visiting. Here are a couple of the drawbacks and benefits of the kitchen faucet. The appearance of the kitchen faucet is dictated by the finish and the handles. However, this will vary from faucet to faucet and you will need to invest in one that matches your style completely. The handles can either be 2 different ones or a single handle that controls both the hot and cold water flow. In the buyers guide you will also notice that these should all be taken into consideration when making your purchase. Now that you know which of the faucets we would classify as the best, you might also be wondering which features we used to determine which ones are the best. Here are our complete list and criterion that we used to find these faucets. You can also use them for finding a different kitchen faucet if none of these on the list appeals to you: style, durability, finish and additional extras. The word luxury is synonymous with style and if the faucet is not stylish enough to compliment your home, you will have no reason to make the purchase. When looking at the design of the faucet, you will need to ensure that it does compliment your kitchen and the ability to improve the overall look for people or visitor using it. Durability is one of the top aspects used to judge any product. When it comes to the kitchen faucet, this is no different and you will need to ensure that it is durable enough to make it worth the price. Brass is one of the best materials as it does not rust and should be perfect for lasting you multiple years without any problems. The finish also closely links to the style, but when looking for luxury, you will need something shiny that will turn heads. Chrome is the most affordable finish you could choose, but it does wear out over time. If you have the funds and are looking for something a little better, you should look for nickel as it does not rust and offers more durability as well. Additionally, you should also keep things like the price and the warranty in mind. The better or longer the warranty, the more confidence it shows from the manufacturer. You should also keep in mind that many of these faucets have a pullout function that should make it a little more functional and the different spray modes that might also be included in the high-end faucets. Now that you have all the details when it comes to these faucets, you should be able to make the right decision and find the one that works best for your home. All of these faucets on the list are highly recommended and tested to ensure quality and value for your money. We would like to thank you for reading this article and we would also like to encourage you to share your thoughts on these faucets. Please let us know in the comment section if you think we might have missed one of your favorites. Thank You for Your Great post with detailed explanation. For small kitchen area which one should i try?